Moonlit Landscape with a Road beside a Canal appeared on the Cologne art market in 1914. One year later it was recorded in the Berlin collection of Otto Held and was auctioned with three other works from that collection at Cassirer & Helbing in 1929. While it was in Berlin the panel was included in an exhibition held at the Paul Cassirer gallery in 1915. The painting was then in Amsterdam with Jacques Goudstikker who exhibited it in 1930 with other new acquisitions made by his gallery. It may have been acquired that year by Heinrich Thyssen-Bornemisza and appears in the Collection’s catalogues from 1937. Gaskell dated the panel to the second half of the 1640s or the early years of the 1650s, a fruitful period when Van der Neer produced his best nocturnal scenes and which continued until the 1660s. The artist introduces the viewer into the composition through the canal that winds through the pictorial space from foreground to background, with a bend on which the brightest light falls. On either side of the canal and following its curves are two paths along which various houses are located. Using a high viewpoint Van der Neer added most detail to the left half of the composition in which a path with a cart and various figures on foot opens up in the foreground then narrows in the middle ground. This creates a triangular space that emphasises the pictorial depth, a device found in other works by the artist. However, it is the sky and in particular the treatment of light at dusk as shadows start to fall on the ground that made Van der Neer an outstanding artist with regard to his ability to capture these effects. In the present panel our eye is drawn to the effects of dusk on the horizon through the heavily impastoed technique and the white light that emerges from the dense mass of clouds. The shadows fall on the left, creating subtle nuances of brightness on the right and beautiful reflections in the water of the canal. 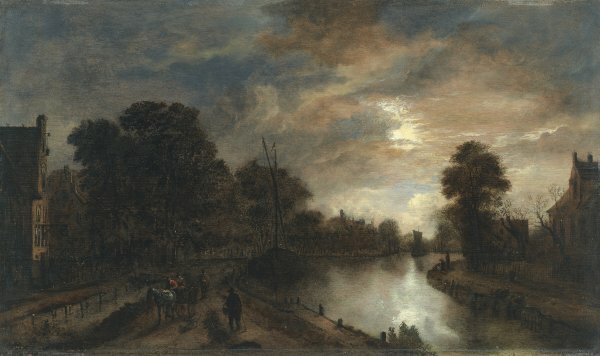 While Van der Neer’s compositions did not generally depict specific places and are created from elements derived from various sources, it has been suggested that this scene may be based on the river Vecht. Bachmann compared the panel with a canvas by the artist in the National Gallery, London, in which Van der Neer used a similar structure with a canal framed on either side by paths and houses.